When traveling to Charleston or any city it is so important of me to pack walking shoes. I personally would rather walk somewhere then take a taxi. When we lived in DC, I took every opportunity to walk to each place I wanted to go (no, I don’t have a fitbit but maybe I should have had one). 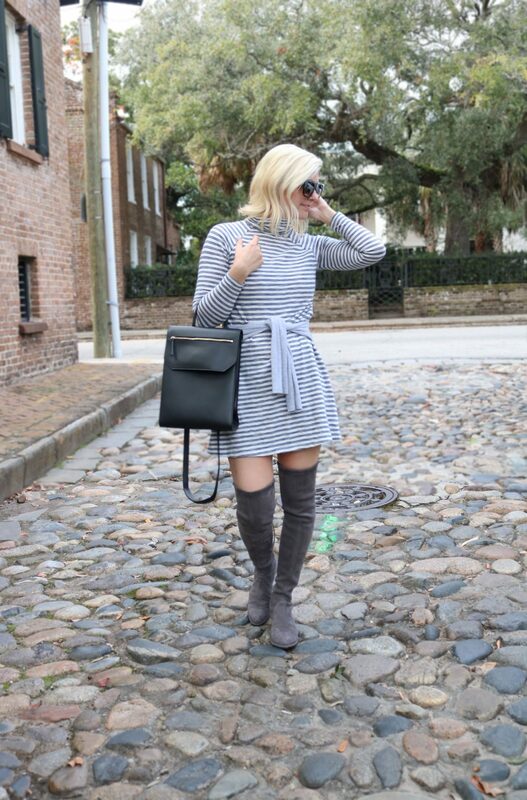 I have loved these Stuart Weitzman boots for that very reason, they aren’t just cute but so comfy! When I splurged on them, I wasn’t sure if they were worth it but I took those thoughts back after the first time I wore them. I try not to surge often but when I do, I try to be smart and purchase things I will wear a lot! I usually splurge on Shoes, Sunglasses and handbags because you can wear them with some many different outfits. To me when splurging on a dress or skirt, you are much more limited to when you can wear it or how often. I usually try to spend less on my clothes and try to shop at ASOS, Abercrombie, Loft, H&M to get staples. When/If you splurge, what do you like to spend those extra dollars on? Thanks for stopping by and I hope you all have a wonderful weekend ahead! My SW are an all time favorite, and I’ve had them for 2 years. Totally worth the splurge! 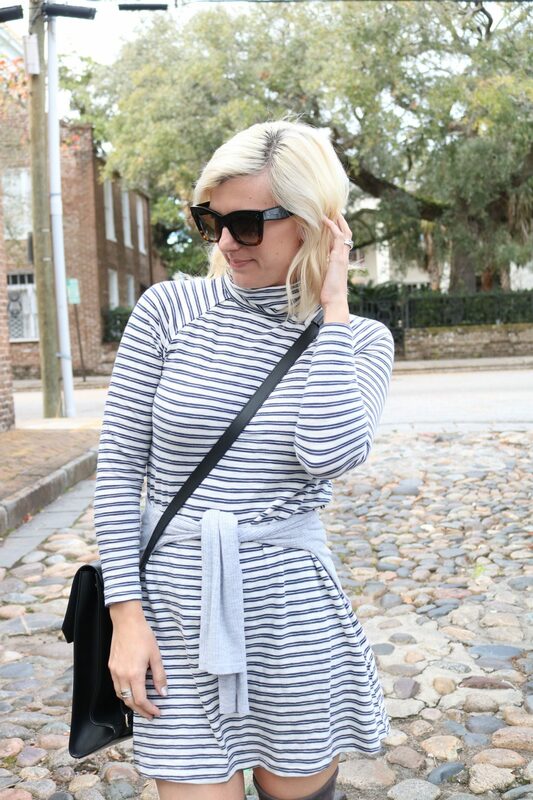 Love your gray and this dress. I totally agree with you on splurges. I’m most likely to splurge on shoes! I’ve only been to Charleston once, but it was so beautiful, definitely going to visit again one day! Totally agree with your mindset when it comes to splurging! I still try to find a deal even when investing, but I just can’t bring myself to splurge on clothing (other than jeans) because the cost per wear is just too low! Just like you, I chose to invest in shoes, sunglasses, and bags because I can wear them sooo often. Plus, I feel like even if your outfit is really simple, a great pair of shoes or nice handbag can really make it look more put together. I splurge on shoes and jackets that can pair with a bunch of outfits. Plus, I truly believe that you get what you pay for when it comes to shoes – better quality and comfort. Found you on IG and love your style!